How do you compete when your product is available at knock-down prices in every grocery store? One way to go upscale and charge premium prices for a premium product. I’ve no doubt this store (actually, there are three of them) is enormously successful, despite selling a product twice the price that can be found round the corner. Why? It’s not just because the product is good — although it is. It’s more than that. Everything the store does is consistent with its message: this is the place where connoisseurs buy the highest quality, natural, hand-raised meat. You’re buying the experience as much as you’re buying the product. The presentation of the products is perfect — everything displayed neatly and nicely labeled in well-lit chilled cabinets. It just looks appetizing. The staff members are all dressed in a crisp, white uniform with a dark apron. 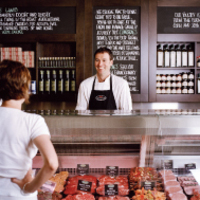 Behind the counter are chalkboards with messages about the benefits of naturally-raised meat, including quotes from well-known chefs and foodies. On the counter is a well-designed leaflet with the same message. There’s a small salad bar with unusual but beautifully prepared salads. Some meat dishes are ready prepared, and when you buy them staff write the cooking instructions on the paper wrapping for you. The staff is knowledgeable about its products. You can see into the butchery at the back — all perfectly clean with a couple of butchers working skillfully to prepare the meat. Create a newsletter with an upscale design consistent with Cumbrae’s brand. Include high-quality, mouth-watering pictures of the finished dishes. Include articles about the health benefits of naturally-raised meat. Don’t dwell on the downside of factory-raised animals as this won’t make for pleasant reading, but emphasize the health and environmental benefits of natural products. Include a special offer. Not necessarily price-led (this isn’t a price-led store) but perhaps for a ready-prepared meat product that is in some way seasonal. One that won’t be available next month, thereby encouraging people to make a return visit to the store right away. In general, make the content so irresistible that people will want to receive it; so it becomes something that people keep at home and refer to. Make it an authority on gourmet cooking with high-quality meat. Encourage people to sign up for it when they visit, carefully emphasizing that their mailing details will not be sold, and giving them a copy of the current edition to look at. This would further boost the loyalty of an already loyal clientele, raise sales by encouraging more frequent visits, and increase referrals through the use of physical referral mechanism.